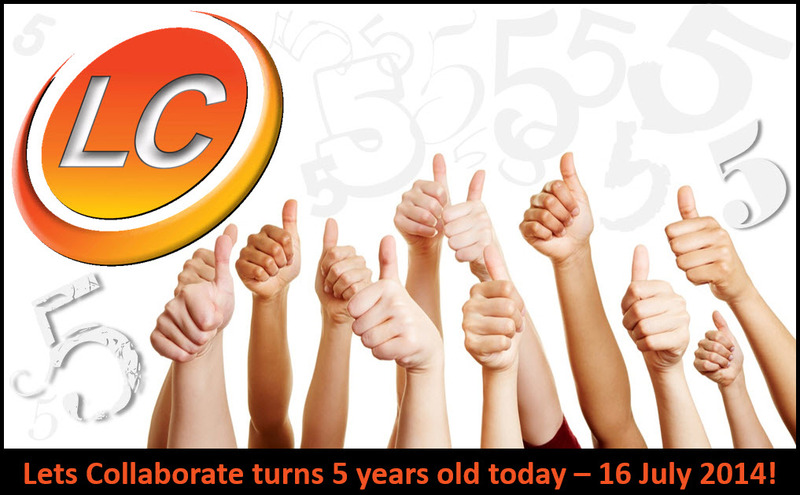 Lets Collaborate Turns 5 Years Old Today! We did it!! We made the all crucial 5 year milestone where less than half of businesses that start are still surviving. And we’re thriving! I walked out of my job at the age of 40 with no plan, no clients and R30 000 in the bank. I just decided there has to be a better way to live. I was so stressed from my previous job it took a year before I could sleep through the night again. I’ve won 5 awards in 5 years – 4 from Microsoft and am one of 6 SharePoint Business MVP’s. This is the first business I’ve ever owned. I’ve never been a vendor in my career, always been on the client side. I was a stock standard Project Administrator for 20 years before I started this business. I worked from my bedroom for a year. I paved the way for a whole host of people to walk out the door and start their own SharePoint businesses because I had the guts to go first, I was none the wiser to this at the time. People still tell me today my story inspires them to go for it. My first contract I got screwed over to the tune of R650 000 when they pulled the plug 3 days before I was supposed to work overseas for them. My second contract I went to Namibia and spent the whole week vomiting from a bug I picked up the day I arrived. Since then we’ve had over 40 blue chip clients use our services and have a collection of great customer stories to tell and testimonials to share. All our business has been from word of mouth and partnerships which is the best form of marketing long term. We’ve been the preferred SharePoint training supplier for Nedbank, FirstRand Bank and Conco. I won 10 business class, round the world tickets from British Airways in a competition by writing a winning mini business plan, the first (and last one) I ever wrote. Lets Collaborate was one of 20 companies that won from thousands of entries and I subsequently spent 2 years jet-setting around the world and speaking at conferences. In year 3, it went from just me to 4 people in the space of 3 months and had to build an intranet overnight consolidating 4 different data sources to accommodate the growth. In year 4 we partnered with a company and became part of 25, it fell through, we went back to 4, retrenched 2, then got bought out and went up to 12; got divorced from that and we’re back to 2 – all in the space of 10 months. We’re rebuilding and restabilizing the business from scratch now that we know what we did wrong. We’ve redefined our values, philosophy, culture and internal systems accordingly. We’re fully booked for the next 3 months for the first time in 2 years; and on the verge of hiring again! We made it through much smarter and much stronger. We’ve lost at least a couple of million Rands of business over the years by being screwed over by less than ethical people. We may have lost money, but gained invaluable insight and experience. I grew a gigantic set of balls, took back my power, re-defined the business and priorities which resulted in us being fully booked! The first 6 months we brought in R133 650; our last financial year we did R2.24million. We’ve had no outside funding ever. We have a niche market sector that I identified 8 years ago when I was still an employee and after 5 years, we are still the market leaders in our space. We believe we are the de facto standard in SharePoint end user adoption in our country. My blog has had over 340 000 hits in 5 and a bit years. We also run a monthly user group and annual event which is coming up in September. After nearly off’ing myself at the beginning of the year from all the stress, I turned my whole life around after I got a life coach and am now fearless! Sheer tenacity and resilience got me through one of the biggest rollercoaster rides of my life. We are a small business that delivers big results and proud of it! 2. Watch your cashflow like a hawk and plan for the quiet months. 3. Define your values, philosophy and what you want the culture to be like in your company – and do not compromise on them. 4. Keep your nose clean and do the right thing always or it will come back to bite you. 5. Know when to get out, (thank you Bill English for something I’ve never forgotten). I am so proud of US babe! 🙂 You are so right in your assessment. It’s wonderful having you on the same journey. 🙂 Love you right back. @Bill, thanks so much. I have never forgotten the kindness you extended me when I was So new to the global SharePoint world, or all the incredible advice you gave me every time I saw you. You have been a Big inspiration in my life and one of this industry’s true gentlemen. @Valda, it helps when I am surrounded by the most incredible people that are uplifting and real. I get inspired every day to be better and do better. @Athena, thank you babe. Yeah I am a major hugger! 🙂 No hand-shaking for me thanks, gotta get those 7 hugs a day in somehow hey. 🙂 Thanks for the wishes hun and you keep doing what you do too please. It works! Congrats, Veronique! I’m glad you’re doing so well!